This is an Blanket Octopus. Photos by Steve Hamedl Feb 2011 Molasses Reef. 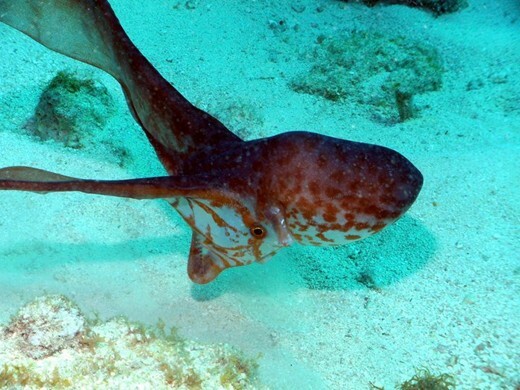 Tremoctopus is a genus of pelagic cephalopods, containing four species that occupy surface to mid-waters in subtropical and tropical oceans. They are commonly known as blanket octopuses, in reference to the long transparent webs that connect the dorsal and dorsolateral arms of the adult females. The other arms are much shorter and lack webbing. These species exhibit an extreme degree of sexual dimorphism. Females may grow to over 2 metres in length whereas the tiny males are at most a few centimeters long. The males have a specially modified third right arm which stores sperm, known as a hectocotylus. During mating, this arm detaches itself and crawls into the mantle of the female to fertilize her eggs. The male dies shortly after mating. The females carry over 100,000 tiny eggs that are attached to a sausage-shaped calcareous secretion held at the base of the dorsal arms and carried by the female until hatching. These species have evolved an unusual defense mechanism: blanket octopuses are immune to the poisonous Portuguese man o' war, whose tentacles the male and immature females rip off and use for defensive purposes. 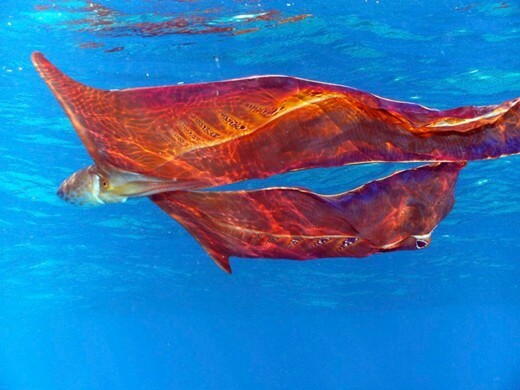 Also, unlike many other octopuses, the blanket octopus does not use ink to intimidate potential predators. When threatened, the female unfurls her large net-like membranes that spread out and billow in the water, greatly increasing her apparent size.